A vivid and violent crime drama, Gangster Squad is gratifying on its own terms as a graphic romp, the strong cast enjoying the freedom to live larger than life, the action a never ending hail of bullets. It's the late 1940's, and former boxer Mickey Cohen (Sean Penn) is a crime boss ruling Los Angeles with an iron fist, paying off the law and scaring off competing cartels with vicious tactics. 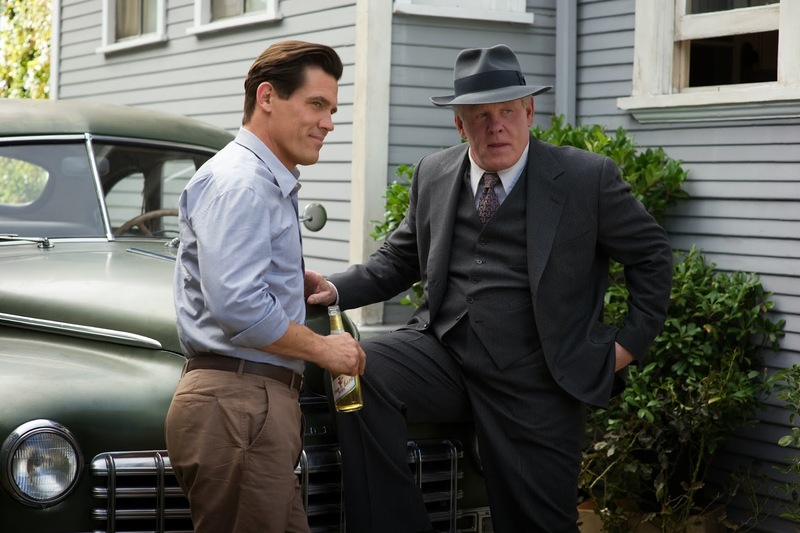 Chief Bill Parker (Nick Nolte) finally decides to act, and empowers Sergeant John O'Mara (Josh Brolin) to create an off-the-books task force to dismantle Cohen's businesses with force. With help from his wife Connie (Mireille Enos), O'Mara selects veteran sharp-shooter Officer Kennard (Robert Patrick), electronics expert Officer Keeler (Giovanni Ribisi), and knife-expert Officer Harris (Anthony Mackie) to join his squad. Officer Ramirez (Michael Pena) tags along as Kennard's side-kick, while O'Mara's colleague and pragmatist Sergeant Jerry Wooters (Ryan Gosling) is a rather reluctant addition to the team. Wooters makes an advance on Cohen's girlfriend and etiquette coach Grace Faraday (Emma Stone), seducing her and gaining an ally within Cohen's inner circle. Keeler bugs Cohen's living room, giving O'Mara the ability to listen in on Cohen's operations. O'Mara then achieves varying degrees of success leading the squad in frontal assaults on Cohen's fake business fronts, disrupting the flow of money and shipments of drugs and weapons. When Cohen finally learns the identity of the squad members, he plans an ambush and a counter attack, triggering an all out war for control of Los Angeles. Mickey Cohen: It's like they say, "All good things must one day be burnt to the ground for the insurance money." With the freedom of only being loosely inspired by real events, Ruben Fleischer directs Gangster Squad with unabashed exuberance. The film is infused with an over the top comic book quality, a willingness to break through all limits, and an excitement to enjoy the expansive view afforded from loosening the shackles and climbing higher. The violence is extreme, the bravado is turbo-charged machismo, while the sardonic hurtling towards bloody showdowns is unstoppable. Gangster Squad has no dull moments, as the action picks up from the first scene and never flags. With plenty of sharp dialogue, the film feeds on its own spiral of momentum, all the main characters getting ever more desperate, and therefore so much more brutal with each other. There is little room for nuance or reflection, but within the non-stop turmoil Fleischer does manage to provide O'Mara with a family and a war veteran's inability to adapt to a world without war. With beautiful sets and costumes, bathed in nostalgic golds and reds, the film recreates an era as it is best imagined. Amidst all the beauty, there are a few blank bullets. The relationship between Jerry and Grace never rings true or catches fire, the two brought together and jumping into bed in a hurry seemingly to continue the better romance ignited by Gosling and Stone in Crazy, Stupid, Love. In Gangster Squad the attraction between them is forced, and settles into an excuse to insert Grace as the only woman playing in a world of violent men. It doesn't help that Gosling delivers one of his less engaged performances, and Stone aims for mysterious but seems plainly bored. Grace: What's your racket, handsome? Jerry: I'm a bible salesman. Wooters: No ma'am, I was just hoping to take you to bed. Better is the tug of war for the soul of the city between O'Mara and Cohen. Both men are single-minded, ultra violent, and direct in their head-on quest to achieve their objectives. That they happen to work on opposite sides of the law becomes less important as O'Mara and his squad adopt Cohen's own tactics to target the criminal's businesses and men. The line between right and wrong blurs as O'Mara stops at nothing to shake the foundations of a corrupt empire, and in doing so risks corrupting himself. Mickey Cohen: You're talkin' to God, Mitch, so you might as well swear to me. Josh Brolin and Sean Penn take turns chewing the scenery, shouting, shooting and delivering large doses of pain. Brolin is the bull unleashed to tackle Penn's rotten syndicate, and the two deserve each other. Penn strips any humanity out of Cohen, giving him the sole purpose of amplifying his own power at any cost. The Will Beall screenplay misses an opportunity to provide Cohen with a bit of a meatier back story. Other than his history as an uncompromising boxer, there is no crusty context to his unconstrained lust for power and control. O'Mara is also coldly brutal, but does get a pregnant and supportive wife who fears for her man, and the emotional scars of combat experience in a world war. O'Mara: You lose everything and you win the war - you're a hero. You lose everything and you lose the war - you're just a fool. 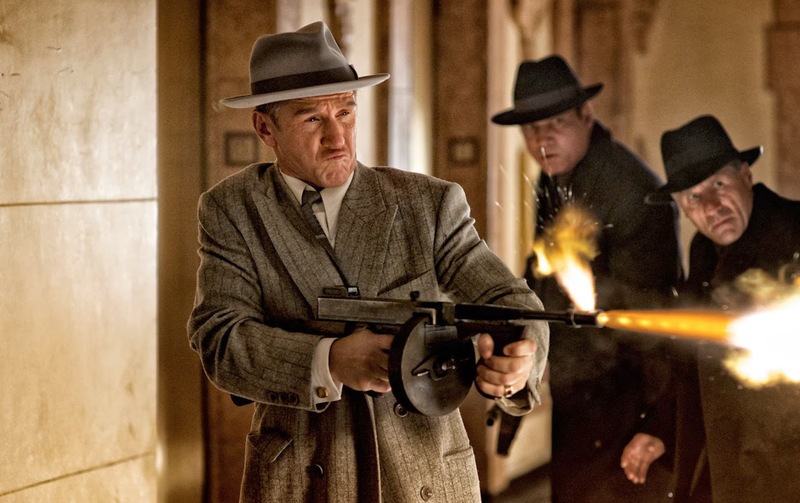 Gangster Squad may lack some qualitative weight, but makes up for it with a rainstorm of lead.